A group of researchers from France and Italy have deciphered the complete genome sequence for the pinot noir grapevine Vitis vitifera, according to a study published by Nature. The draft sequence of the grapevine genome is the first one produced for a fruit crop and fourth for a flowering plant after rice, Arabidopsis and poplar. The French-Italian Public Consortium for Grapevine Genome Characterization, which collectively authored the study, discovered a large number of gene families related to wine characteristics, like those coding for terpenes and tannins, compounds responsible for the wine’s aroma and taste. Multiple copies of the genes coding for enzymes necessary for the biosynthesis of resveratrol were also found. Resveratrol is an antioxidant found in red wine and known for its anticancer, antiviral, anti-inflammatory and neuroprotective properties. The large number of gene families was attributed to man’s selection and hybridization during thousands of years. The findings will pave the way for genetic manipulations to improve the flavor and pathogen resistance of a crop that generates some 200 billion US dollars a year in revenue. Plants have little liking to aluminum, especially if it is aluminum in acidic soils. Because of acidity, aluminum from clay minerals dissolves in the soil, and gets converted to its toxic charged (ionic) form. Aluminum toxicity in acidic soils is a big problem in crop production in as much as half the world's arable land, mostly in developing countries in Africa, Asia and South America, are acidic. To provide plants with protection from aluminum, researchers at Cornell University have isolated a novel aluminum-tolerant gene found in some cultivars of sorghum. The gene expresses a protein in the root tip that release citric acid into the soil in response to aluminum exposure. Citric acid binds aluminum ions very effectively, preventing the toxic metal from entering the roots. The gene, they discovered, is only turned on when aluminum ions are present in the surrounding soil. The researchers have now used the sorghum gene to engineer transgenic aluminum-tolerant Arabidopsis thaliana and wheat plants. New genetically-engineered aluminum-tolerant sorghum lines are expected next year. Read the complete article at http://www.news.cornell.edu/stories/Aug07/SoilsKochian.kr.html. Plants get sick too, but they have special genes that provide resistance to plant diseases. A plant gene that confer resistance to one disease, however, may also produce susceptibility to a different disease, as botanists at the Oregon State University found out. Using Arabidopsis thaliana engineered with the Pc-2 gene, they reexamined the case of the 1940s epidemic of Victoria blight, a fungal disease in oats. At that time, an imported variety of oats that contains the Pc-2 gene was widely-planted because of its resistance to oat rust, another costly crop disease, but it proved to be susceptible to Victoria blight. As a rsult, Its use had to be discontinued. The complete article is available at http://oregonstate.edu/dept/ncs/newsarch/2007/Aug07/geneticresistence.html. Scientists have successfully modified corn to produce recombinant gelatin and have recently devised a method to recover and purify the small amounts of gelatin present in the young transgenic corn. The method, developed by Charles Glatz at Iowa State University in Ames and FibroGen, Inc., in South San Francisco, used a four-step recovery system to separate the recombinant protein from other corn proteins with sufficient purity . The details of the new process was presented by Cheng Zhang, a doctoral student at Iowa State University at the 234th American Chemical Society meeting. Gelatin, a jelly-like substance derived from the breakdown of collagen, has been commercially produced for pharmaceutical purposes from the by-products of the meat industry: the skin, tendon, bone, cartilage and connective tissues of animals. However concerns on the possible presence of infectious agents in animal by-products, and the lack of traceability of the source of the raw materials necessitate the production of plant-derived collagen. The news article can be viewed at http://www.physorg.com/news107072126.html and http://www.newswise.com/articles/view/532430/details for the research abstract. Public private-partnerships are beneficial to plant breeding research and can be advantageous to all the parties involved, said a group of researchers in the Netherlands. One of the benefits that private industries can derive from such venture includes the use of plant research materials that are closely related to the germplasm materials they use in-house. The academia may in turn benefit from the additional funding and resources from the industry. The group provides as an example the collaborative activities in the tomato project of the Centre of Biosystems Genomics (CBG), in an article published in the journal Euphytica. They relate how industry-derived elite inbred germplasm of tomato was used to create new genetic resources utilized in academic research, and describe how this was achieved. The paper can be accessed at http://www.springerlink.com/content/qn547t71p8752v12/. Bamboo is a part of life in Asia, and soon it will be in Africa, thanks to the effort of the bamboo enthusiast, Chin Ong of the World Agroforestry Centre (ICRAF) in Nairobi. "Our role here at the World Agroforestry Centre (ICRAF) in Nairobi is to prove that planting bamboo is a useful and profitable venture for both urban people and smallholders in African villages", he says. Africa is home to many bamboo species including Arundinaria alpina, a species of bamboo native to Kenya, and the giant bamboo Dendrocalamus giganteus. Because of its strength, it is being promoted as a substitute for hard and soft woods and as reinforcement for concrete. Bamboo roots can be useful in cleaning wastewater, according to Ong. The extensive root system can absorb surplus nitrogen, phosphorous and heavy metals found in sewage water, and lock them in the plant so they do not cause pollution in water courses downstream. It can also be a sustainable source of domestic fuel. Twenty local and exotic species are now being tested to find the best varieties for different uses. The complete article is available at http://www.new-agri.co.uk/07/04/develop/dev4.php. Kenya’s Ministry of Agriculture recently launched high-yielding and drought and disease resistant varieties of maize, sugarcane and wheat to enhance the country’s food security. The seeds, developed by the Kenya Agricultural Research Institute (KARI) are being marketed by 53 seed companies in Kenya, as well as in Uganda, Tanzania, Congo and Sudan. Poor rains in parts of pastoral and agricultural marginal areas could precipitate food shortage this year and Agriculture Minister, Kipruto Kirwa, urged the farmers to use the new seed varieties if the country is to improve its strategic food reserve. However, because of the exorbitant prices of the new varieties, many small scale farmers in Kenya still rely on their own traditional seeds. Kirwa encouraged the seed distributors to lower their prices and expand their limited investment retail networks. Sufficient food supply for Kenya can only be attained through a joint effort of the government and private companies. Egyptian agriculture can benefit from the use of Bt maize. "In the absence of a clear planting date strategy, the relative poor performance of conventional chemical control, and the high and uniform efficacy of Bt maize on all three Egypt’s maize stalk borers, Egyptian maize production would likely benefit greatly from the adoption of Bt maize, and deserves close consideration, " concludes Dr. Magdy Massoud, from the Faculty of Agriculture at Saba Basha, University of Alexandria, Egypt. Massoud conducted a field trial to study the effect of conventional pesticides and Bt maize hybrids on the maize borers in Egypt. He found that pesticide treatment had a modest influence, at best, in controlling damage by the three stalk-boring species only at the seedling and flowering stages. "In sharp contrast to pesticide treatment, the Bt maize hybrids exhibited nearly complete protection from damage by the borer species. The infestations of these borers were negligible or completely prevented in Bt plants throughout the whole season for all sowing dates". The study concluded that the range of infestation reduction was 90-100% for Bt hybrids. In damaged Bt maize plants, the lesion consisted of evidence of failed attempts of larvae to bore inside the plant. In these instances however, no larvae, alive or dead, were found within stalks. For more information please contact Dr. Magdy Massoud at magdymassoud@yahoo.com or Dr. Ismail AbdelHamid, Egypt Biotechnology Center director at ismail@egypt-bic.com. A National Program for Sustainable Human Development in the Comoros was recently launched to assist farmers and fishers to raise their income and food security. A much-needed natural resource management practice will be introduced by the program to improve productivity for the 20,000 families living in poor, environmentally fragile areas of the islands of Anjouan, Grande Comore and Mohéli. Among other things, the program will: introduce sustainable practices to rehabilitate degraded lands and coastal areas; introduce a system of terraces and ‘live fences’ in water catchment areas to help preserve soil fertility and prevent silting; and help revitalize agricultural training centers under a new more efficient and participatory type of management. The US$7.2 million fund will come from the International Fund for Agricultural Development (IFAD), the Global Environment Facility and the Comoros' Diaspora. Two decades ago, the golden nematode and potato virus Y (PVY), two especially persistent scourges of potato were brought under control. But a new race of nematode and the widespread acceptance and planting of potato varieties which turned out to be asymptomatic carriers of PVY jeopardized it all. PVY’s resurgence impedes efforts to identify virus-infected seed potatoes and limit their distribution. These developments have been disheartening to people fighting to save the spud. Agricultural Research Service (ARS) and Cornell University researchers have introduced more than 30 potato varieties that resist the original nematode race. The resistance is due to a potato gene called H1. But H1 has no effect on the new nematode race, first identified in 1995, which scientists have dubbed “Ro2.” At present, there is no rapid identification scheme for the two races. Scientists are hoping Ro2’s eggs and genes can be used as part of a race-identification strategy. An emerging molecular method called “RNA interference” that uses fragments of double-stranded RNA to hinder, or silence, gene expression may someday help develop an improved spud variety. PVY threatens not only potato, but also other crops such as tomato, pepper, and tobacco. The once-distinct PVY strain groupings are becoming inapplicable because of genetic recombination and mutation in the virus. To control the spread of PVY, ARS plant pathologist Stewart Gray has helped develop and implement the Canada/U.S. Management Plan for Potato Viruses That Cause Tuber Necrosis. PVY management strategies will be improved, and regional approaches to the PVY problem may be more appropriate, according to Gray. To read more: http://www.ars.usda.gov/is/AR/archive/aug07/potatoes0807.htm . Monitoring boll weevil and tracking weevil movements may not be one's idea of having a good time, but this work is surely vital for protecting cotton crops. USDA Agricultural Research Service (ARS) entomologist Tom Sappington has tracked local weevil movements by marking the insects with enamel paint or fluorescent powders and recapturing them later. Now he uses “microsatellites”—short, repetitive DNA sequences—and population assignment tests to find out where weevils came from. In 2004, a small group of immigrant boll weevils was found next to an eradication zone in Durango, Mexico, where weevils had not been reported for about 10 years. Sappington used weevil microsatellites from this group to study the four other weevil populations from northern Mexico and southern Texas. In this way, the origin of the weevils can be determined. His findings also indicated that final weevil eradication efforts in Texas were being hindered by weevil migration within Texas and the ones from Mexico. Sappington’s work demonstrates that powerful microsatellite markers and population assignment tests are practical tools for monitoring and managing boll weevil pest introductions throughout North America. Read the news article at http://www.ars.usda.gov/is/pr/2007/070823.htm. A new variety of soft white winter wheat named "Goetze" will soon replace "Foote", another winter wheat variety in Williamette Valley, Oregon that has become susceptible to stripe rust. Goetze wheat has superior yield potential, disease resistance, short stature and adaptation to western Oregon production conditions. It was named after Norm Goetze, a former Extension agricultural program leader and associate director of the Oregon State University Extension Service. Goetze wheat took more than 12 years to develop and is best adapted to the Willamette Valley and areas of Oregon where the wheat variety “Gene” is commonly grown. Goetze has less cold tolerance than Stephens or Tubbs, which is more similar to the variety Gene. Goetze requires little or no vernalization to initiate flowering – factors that increase the risk of winter damage when the variety is grown further north and east. The new Goetze wheat variety is also moderately resistant to Septoria leaf blotch, an important disease of the Willamette Valley. Read the news article at http://oregonstate.edu/dept/ncs/newsarch/2007/Jul07/newwheat.html. Dow AgroSciences announced an agreement with Australia’s Hexima Ltd. to test cotton plants using Dow’s proprietary genetic constructs. The agreement involves the completion of a series of research activities, and testing over the next 18-24 months, resulting in the production of viable transgenic cotton seeds to provide better solutions and more options for cotton growers. “This collaboration represents Dow AgroSciences’ commitment to provide differentiated solutions to customers globally through unique technology and capabilities,” said Daniel R. Kittle, Dow AgroSciences Vice President for R&D. Dow AgroSciences currently produces PhytoGen(TM) brand cotton seed and is marketing WideStrike(TM) Insect Protection for the U.S. cotton market. CNTBio, the Brazilian National Technical Commission for Biosafety, has recently approved the commercial release of the biotech maize variety Guardian, developed by Monsanto. The release required the approval of monitoring and coexistence plans presented by the technology developers. The commercialization of Guardian maize still requires the ratification by the National Committee of Biotechnology, which has 60 days to pronounce itself. This approval brings the number of biotech plants released in Brazil to four. Last May CNTBio approved the commercialization of LibertyLink maize. The two biotech maize varieties follow the commercialization of soybean with tolerance to herbicide, and insect-resistant cotton. Syngenta introduced a new sugar beet variety for cultivation in tropical climatic conditions in India. The tropical beet, which is expected to bring significant agronomic and environmental advantages, delivers output yield comparable to sugarcane and can be used both for processing sugar for food and conversion to ethanol. It is faster growing and allows farmers to grow a second crop on the same land, thus increasing agricultural output and raising farmer income. First harvests delivered the expected high yield of top-quality sugar and the fast growth of tropical beets increases the annual ethanol output over sugarcane. "The Indian government is highly interested in Syngenta’s technological capabilities to support growth of India’s agricultural sector", said Sharad Pawar, India’s Minister for Food and Agriculture. "The successful introduction of sugar beet leads to higher sugar output in a shorter period and using less water. I am sure the Indian sugar industry will happily work together with Syngenta to further optimize the crop and introduce it to growers across the country." The company’s efforts to develop tropical sugar beet took over ten years and they are now set on exploring use of tropical beets in regions with poor soil conditions. To facilitate the appreciation and understanding by stakeholders of Philippine public-sector developed genetically modified crops, a series of capacity building workshops are being organized and facilitated through multi-sectoral involvement.The workshops focus on the papaya ringspot virus-resistant (PRSV-R) papaya and fruit and shoot borer-resistant (FSB-R) eggplant which are being developed by scientists at the University of the Philippines Los Banos-Institute of Plant Breeding (UPLB-IPB). These collaborative activities are joint undertakings of several agencies like the Department of Science and Technology-Philippine Council for Agriculture, Forestry and Natural Resources Research and Development, the Department of Agriculture-Bureau of Plant Industry, International Service for the Acquisition of Agri-biotech Applications, Program for Biosafety Systems, and SEARCA Biotechnology Information Center. The activities include a consultative workshop for potential collaborators of multilocation field trials, a food safety and risk communication workshop for those involved in the product development and delivery of the said products; and risk management and social marketing workshops for field trial cooperators and regulators. Additional information on these workshops can be provided by emailing Sonny Tababa of the SEARCA Biotechnology Information Center at spt@agri.searca.org. Vitamin C is an essential vitamin that the body needs to perform crucial metabolic functions that help rebuild body tissues and fight infection and disease. Deficiency in Vitamin C can cause the sailor disease called scurvy. Vitamin C was discovered in the early 1930s and is plentiful in fresh fruits. Vitamin C pills are popular but their overdose can injure the kidney. Fruit source is preferred since the Vitamin is absorbed slowly and efficiently in the body and fruits provide other healthy nutrients as well as fiber. Recently, a Horts Research team in New Zealand isolated from unedible kiwifruit variety the last undiscovered enzyme in the pathway in Vitamin C biosynthesis and proved that the enzyme controlled Vitamin C levels in plants. Dr. Sean Bulley and the other scientists in the research team will use this new knowledge to identify molecular markers that will enable them to select and breed fruits that contain high levels of Vitamin C. This technology can therefore provide consumers a natural, convenient and healthy opportunity to increase their Vitamin C intake, while also enjoying all the added benefits of eating whole fruits. The Philippines may yet to learn from India's experience in managing Bt cotton and thus boost the farm sector through agricultural biotechnology, said the country’s Department of Agriculture. India’s agricultural biotechnology has emerged as one of the fastest growing in the entire world in recent years, and a report by the US Department of Agriculture (USDA) attributes this to the cultivation of Bt cotton. Agricultural biotechnology in India has become the third largest contributor among various biotech sectors, with total revenues of more than $229 million in 2006-2007, which meant a growth of 55 percent, the USDA said. This increase should encourage Filipino farmers to adopt modern biotech applications. Efforts are being made in the Philippines. A number of Filipino biotech experts nurtured the commercialization of Bt corn more than four years ago in the belief that it would boost the country's production and trigger an agri-biotech revolution. In addition, a number of biotech products like papaya and eggplant are in the pipeline and waiting for commercial release. Biotech advocates in the Philippines said that the only way to compete in agricultural trade and level the playing field is through agricultural modernization. The Department said that current advances in biotechnology, aided significantly by international networks, should promote technology transfer and speed up commercialization in the country. The Indonesian Institute of Science (LIPI) announced that they will focus on three development fields of research and technology: information technology and communication; biotechnology; and material science based on nanotechnology. Chairperson Umar Anggoro Jenie emphasized that as a governmental body, LIPI should review the achievements of the institute in the last 40 years, to serve as the bases of action for the coming years. In terms of biotechnology, he expounded that several genetically engineered crops have been developed in the Institute. An insect resistant rice variety is now on its third year of field trials to obtain biosafety certification. There are also some medicinal products which were developed through biotechnology that will undergo clinical trials. Other initiatives in the transgenic research include the development of drought and submergence tolerance in rice. See the Indonesian news article at http://www.kompas.com/kompas-cetak/0708/22/humaniora/3780140.htm or contact dewisuryani@biotrop.org for details. The western corn rootworm has landed - in Germany. One of the most dangerous corn pest in the world was sighted recently in a field in the Ortenau region of Baden in southern Germany. Two more adult rootworm beetles were observed in neighboring Alsace in early August. Persistent populations of this corn pest have also become established in Austria, Switzerland and France. The insect has been classified as a quarantine pest in the European Union because of the enormous economic damage it causes. To control the spread of the corn rootworm, farmers use insecticides. Another strategy, though still not available to farmers in Europe, involves genetic modification of the corn seed. No genetically modified variety with resistance to rootworm has been given regulatory approval in the European Union so far. The experts are unable to say how serious the threat is in Germany at the moment. In the longer term, however, it will probably not be possible to stop the rootworm completely. To read more about the western corn rootworm, visit: http://www.bayercropscience.com/bayer/cropscience/cscms.nsf/id/EN_2007_NST-032?open&ccm=400. Steven Ley and his group at the University of Cambridge, UK, succeeded in making a synthetic version of the natural insecticide azadiracthin, after 22 years of efforts. Azadirachtin is an environmentally friendly insecticide which was isolated from the Indian neem tree in 1968. It is biodegradable and not toxic to humans. Azadirachtin works by disrupting the growth cycles of insects and detering them from feeding on plants. Although the insecticide can be easily isolated from the neem seeds, synthetic compounds can be used for detailed studies. Currently, the group of Ley has started studies to further understand the biology of the compounds with the aim of making simpler, more effective analogues with reduced sensitivity towards light, acids and bases. They have also identified a protein in insects that binds to azadirachtin. The authorities in Serbia and Denmark have now given the green light to field trials of Arabidopsis plants that can be used to detect the presence of explosives and landmines in the soil. The deliberate release will take place in an area close to Novi Sad in Serbia, and will be conducted in cooperation with the agricultural institute NS Seme in Novi Sad. Trials will also commence immediately in Denmark, in Jægerspris (Denmark). “The approval is an important milestone in Aresa’s further development of the landmine detection plant RedDetect(TM). It is important to Aresa to be able to test the plants outside Denmark, and more importantly in an area, where landmines do occur and soil conditions are similar to where we potentially are going to detect landmines and other explosives” said Ole Andersen, of Aresa. Aresa plans to transfer the RedDetect(TM) technology to tobacco plant by next year, thereby increasing the robustness of RedDetect(TM) technology as well as its commercial potential. Aresa is a plant biotech company established in 2001, a spin-off from the Institute of Molecular Biology at the University of Copenhagen. Dow AgroSciences, a wholly owned subsidiary of The Dow Chemical Company, has announced that it will continue to expand its global corn germplasm portfolio and corn business with the acquisition by its affiliate Agrigenetics, Inc. of Duo Maize, a corn germplasm company focused primarily on early maturing germplasm silage applications for northern climates. Duo Maize is based in Rossum, Netherlands. The agreement includes all of the corn silage germplasm developed by Duo Maize. Fusarium oxysporum, the causal agent of Fusarium Yellows of sugar beet, is a serious threat to sugar beet production worldwide. Although some sugar beet varieties are known to be resistant to Fusarium, the basis for resistance is not well understood. Identification of genes responsible for the resistance has proven to be difficult for a number of reasons. There is a large variability among pathogens in a population, and the response of sugar beets to Fusarium infection is highly isolate-specific. In addition, the efficacy of resistant beet genotypes varies by geographical location. To establish basic a understanding regarding the nature of susceptibility of sugar beets to Fusarium infection, a group of researchers from the Agricultural Research Service of the US Department of Agriculture monitored the protein changes in resistant and susceptible sugar beet germplasm following inoculation with the pathogen. Proteins uniquely induced by Fusarium infection in susceptible varieties include tonoplast aquaporins, proteinaceous pores that regulate water flow and solute transport, and cyclophilin, a protein known to play an important role in fungal virulence and defense activation. Regulating the expression of aquaporin through gene silencing has created increased resistance to root knot nematodes in tomato suggesting that exploitation of similar mechanisms in sugar beet might prove to be effective in a disease control strategy. These results will provide a framework for identifying markers for resistance selection and for the development of more advanced disease control strategies. Bacillus thuringiensis (Bt) Cry1A are proteins toxic only to insect larvae in the order Lepidoptera. This family of toxins is widely used for insect control with Bt-transgenic crops, particularly cotton, and in Bt microbial pesticides. Several models are proposed for the mode of action of Cry1A toxins, but in all the models, the monomeric form of the toxin binds to Bt-R1, a specific cadherin first characterized from the midgut of the tobacco hornworm. Cadherins are proteins that play important functions in cell to cell adhesion (as a sort of glue holding cells together in a tissue). A specific part of this cadherin, CR12-MPED, was reported to be the functional receptor region for Cry1Ab binding and toxicity. Jiang Chen and colleagues from the University of Georgia observed an increase in insect mortality if purified CR12-MPED is introduced together with Cry1Ab to the tobacco hornworm (Manduca sexta). Although its synergistic mechanism is not yet fully characterized, CR12-MPED peptide has the potential to augment the control of lepidopteran pests by Cry1A toxins. This synergist is a good candidate for the development of a more effective strategy to control lepidopteran pests that are currently not being efficiently controlled by Bt crops. Current researches focus on the action of CR12-MPED toward other insect groups. But because homologues of Bt-R1 cadherin are present in other lepidopteran species, it is likely that CR12-MPED may also enhance Cry1A toxicity towards alternative lepidopteran pests. Corn is one of the world's important staples that is consumed by humans and livestock, and a rich source of industrial raw materials. It provides carbohydrate, protein, and oil but low in the essential amino acid lysine. Many different strategies have been used and tested to increase corn lysine through breeding and genetic engineering. Recently, scientists at Monsanto headed by Alessandra Frizzi used a method of simultaneously expressing a deregulating lysine biosynthetic enzyme CordapA and reducing a bifunctional lysine degradation enzyme, LKR/SDH. The transgene introduced in corn contains Cordap A gene and the inverted gene sequence of LKR/SDH, both genes controlled by one promoter. Expression of inverted sequences induces silencing of the target gene. Transgenic corn grain was found to accumulate free lysine to as much as 4000 ppm compared to 100 ppm in the control. These results proved that this transgenic approach is effective and can be used in manipulating other metabolic pathways that sometimes require expression of one gene and silencing of another. Japanese cedar (Cryptomeria japonica) pollen, a potent seasonal aeroallergen causes cedar pollinosis with rhinitis, asthma and conjunctivitis as clinical symptoms in humans and dogs. The economic costs associated with this disease are already high and are expected to rise as healthcare costs increase and as environmental adjuvants, such as air pollutants, induce and aggravate the symptoms. The development of an affordable and clinically effective vaccine for controlling the disease is thus a high priority for public health. Japanese scientists were able to express a recombinant allergen Cry J 1 isolated from cedar pollen, fused with the rice glutelin in the rice endosperm. The Cry J 1 allergens give low specific IgE-binding activity but contain all of the T-cell epitopes of the allergen. About 15% of the total seed protein in transgenic rice contains the fused glutelin – Cry J 1 protein. The production of this recombinant protein can be used as a universal, safe and effective “tolerogen” for rice seed-based oral immunotherapy for cedar pollen allergy in humans and other mammals. The International Centre for Genetic Engineering and Biotechnology (ICGEB) (ICGEB) in Trieste, Italy, announces two biosafety workshops in 2008. A workshop on "Introduction to Biosafety for the Environmental Release of GM Crops: Evaluation of Scientific Data and Risk Assessment Dossiers" will be held at the ICGEB Biosafety Outstation, Ca' Tron di Roncade, Italy, from May 19-29, 2008. Details may be obtained by emailing courses@icgeb.org. "Workshop on "Risks, Benefits and Opportunities from the Release of GMOs in the African Regions" is scheduled to be held in Cape Town, South Africa, in September 2008. Requests for information and applications may be made to Dr. Viresh Ramburan of Stellenbosch University, South Africa at ramburan@sun.ac.za. An updated version of a booklet "Gene Technology in Australia - Fact not Fiction" has just been released by Agrifood Awareness Australia Limited. It contains a wide range of information from the science of gene technology, to the laws and guidelines surrounding research, and opinions on the technology from government, science and farming industries. Other information include gene technology around the world, impacts and uses of the technology, and gene technology in Australia. The booklet can be downloaded at http: http://www.afaa.com.au. A policy brief on "Applying biotechnology in a safe and responsible manner: Justification for a biosafety law in Kenya" has just been released by the International Service for the Acquisition of Agri-biotech Applications AfriCenter and the Program for Biosafety Systems. The brief was published to enhance understanding of the objectives, scope and provisions of the Biosafety Bill, 2007, published by Kenya’s Ministry of Science and Technology. The Bill lays down legal and institutional frameworks for governing genetically modified organisms in Kenya. Authors David Wafula, Gabrielle Persley, and Margaret Karembu hope that this publication will encourage objective and constructive debate of the Bill. Dr S. Karim from the Swedish Agricultural University discussed the potential of new biotechnology crops in helping to solve the problems of salinity, drought and submergence tolerance during a seminar organized by the Bangladesh Biotechnology Information Centre (BgBIC). 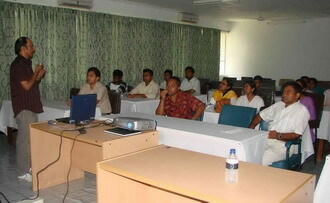 About 55 teachers, scientists, and post graduate students of different schools attended the seminar held at the Bangladesh Agricultural University in Mymensigh, Bangladesh. In opening remarks, Prof. M. A. Halim Khan, Vice Chancellor of BSMRAU, urged scientists to adopt biotech crops particularly those which have been evaluated and certified as safe for food and feed. Email Dr. Khonduker Nasiruddin of the BgBIC at nasir@yahoo.com for seminar details.